As rainy season begins, consumers are pulling out their umbrellas and rain boots, ready to stay dry when they need to go out. But that rainy day preparation needs to extend to your car, especially since rain is the deadliest weather driving hazard. To keep you safe this spring, your Lakeland-area Ford dealership has prepared a handy weather preparation guide for your car. With a little extra work, you can keep your family safe during the rainiest season of the year. Check Your Tires—Use the penny test to make sure you still have enough tread on your tires to safely make it across wet roads. Change Your Wiper Blades—Inspect your wiper blades and make sure they’ll keep your windshield clear even during the heaviest storms. Check Your Headlights and Taillights—When rain makes visibility low, other drivers will count on your headlights and taillights to see you on the road. Check Your Brakes—If you don’t know how to check your car’s brakes, take it to a mechanic to have it inspected. Store an Emergency Kit—Heavy downpours can force you to pull off the road and wait. Make sure you have an emergency kit to keep you safe and comfortable. Carry Jumper Cables—Even if you don’t know how to use jumper cables, they can come in handy if your car won’t start. A kind stranger or security guard will ask if you have them when you ask for help. Use a Windshield Water Repellent—Windshield wipers help, but in heavy rain, you may find that they’re insufficient. A water repellent like Rain-X can dramatically improve visibility. Wash Frequently—During rainy weather, people often skip the car wash, but rain carries a variety of pollutants that create a finish-damaging film. If you can’t make it to the car wash between rainy days, rinse off the residue at home with a garden hose. 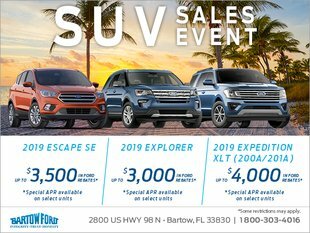 Your Lakeland-area Ford dealership, Bartow Ford, knows car care is important year-round, both for the life of the vehicle and its occupants. As rainy season begins, it’s more important than ever to do a quick safety check of your vehicle to make sure you’re prepared for standing water and low visibility when you’re on the roadways.